Los Angeles Airport Police officers seized more than 230 pounds of marijuana from a private jet Sunday April 8, 2018 at Van Nuys Airport. Los Angeles Airport Police officers seized more than 230 pounds of marijuana from a private jet at Van Nuys Airport. The pot was found late Sunday while luggage was being placed on the plane for a charter flight to Ft. Lauderdale, Florida, authorities said. "While the luggage was being loaded, one bag tore open and some marijuana fell out," said Los Angeles World Airport Police Officer Rob Pedregon. The pilot, who was watching the loading, instructed workers at the jet terminal on Hayvenhurst Avenue to call police. More than 200 pounds of marijuana were seized from a charter jet Sunday April 10, 2018 at Van Nuys Airport. Airport officers arrived within four minutes but the charter passengers associated with the luggage had already fled, Pedregon said. Police K9s were brought to the ramp to search the plane. 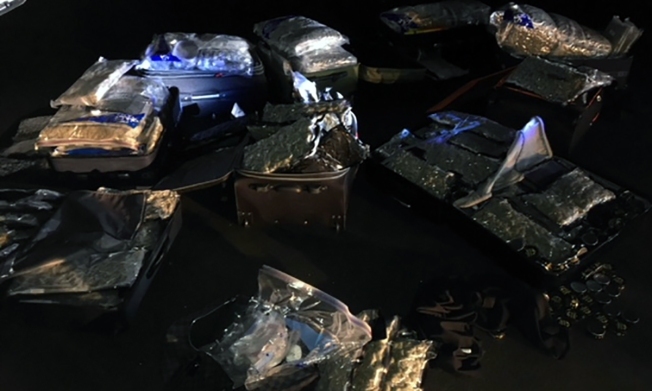 A total of 232 pounds of packaged marijuana was found in 10 suitcases, police said. The jet, a three-engine Dassault Falcon 50 registered to a company in Massachusetts, is part of a regular charter fleet, and its owner and operators were not suspected of any involvement in the drug shipment, the authorities said.